Bat Bugs, i.e. Cimex adjunctus, are close relatives to bed bugs in fact they are so close bed bugs that not many people can tell them apart without the use of a 30X magnification loupe. 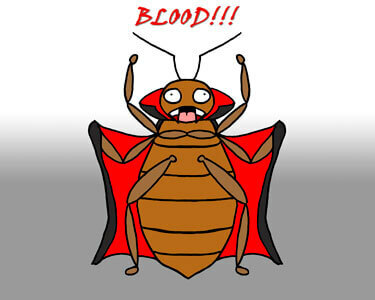 Unlike bed bugs which are associated with the movement of people, bat bugs are associated initially with bats. They only tend to invade people’s homes in the absence of their primary food source such as when bats are disturbed or migrate. Behaviourally they are very different to bed bugs and tend to return to the primary harbourage between feedings, presumably because they prefer bat blood to human blood. As such the treatment method differs greatly and may be subject to local wildlife regulations such as those which provide absolute protection to some bat species. How to confirm a sample is bat bug? In the case of scanned images we would recommend that you upload them to the Bedbugger Forum for a specialist to give an opinion. Other options include a university extension entomology department or Bed Bugs Limited postal ID service. The treatment methods and patterns are different – normal bed bug treatment will not solve a bat bug issue because the activity is not focused on beds where it needs to focus on the original harbourage and how they enter the property. The true source of the issue must be treated first – this often means exclusion of the primary host species and ensuring it remains excluded. Incorrect initial treatment steps will delay the time it takes to fully resolve the issue. Correct confirmation from the start can reduce the time it takes to resolve the problem down to a single visit whereas stories of people being repeatedly treated for bed bugs that are later confirmed as bat bugs are unfortunately very common. What signs can help indicate bat bugs rather than bed bugs? Collecting and confirming based on a live adult sample will always be the most accurate way to proceed. This is best done in a smooth sided clean glass or, if no other option is available, through the use of a clear adhesive tape. How does treatment differ between bat bugs and bed bugs? As such the skills required are better suited to “wildlife management pest controllers” than urban pest controllers. The following companies have approached us and provided documentation to support their inclusion on this list. Although we have reviewed their documentation and information, we have not been able to review their specific jobs and work quality although one is often an indication of the other. identification key to confirm bat bugs or bed bugs.